Several modern classics were published fifty years ago. 1963 saw the publication of Kurt Vonnegut’s Cat’s Cradle, Sylvia Plath’s The Bell Jar, and Thomas Pynchon’s V. It also saw the publication of a science fiction novel by the French author Pierre Boulle La Planète des Singes, released in England as Monkey Planet. In the United States, the very underwhelming book cover deems calls the book Planet of the Apes. After looking at that book cover, some of you may be wondering why a science fiction author penned a war novel. What you should be asking is why a former secret agent wrote a sci-fi novel. During World War II, Boulle assumed a false identity and helped support resistance forces in Asia but was eventually captured by enemy forces. Le Pont de la Rivière Kwaï is only semi-fictional. 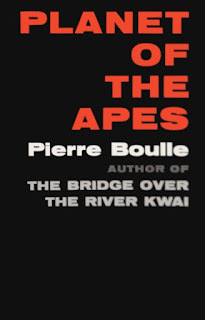 Not only did Boulle write two bestselling novels that were adapted into critically acclaimed films (both Planet and Bridge have been added to the National Film Registry), but Boulle won the Academy Award for Best Adapted Screenplay for The Bridge on the River Kwai. This is a particularly remarkable achievement when you take into account that Boulle did not know English. The actual screenwriters, Carl Foreman and Michael Wilson, had been blacklisted in the Second Red Scare. The Academy attributed the award to them in 1984.